It is often stated that the world stock market indices have similar cyclical structures. This is particularly true with respect to the US indices and the European indices (British,French,German). After watching David’s latest HTR video I decided to take a look from a spectral viewpoint. It turns out that they are virtually identical. There are differences in the underlying trend and amplitude modulation which causes some minor phasing differences, but that is to be expected. The underlying spectral structure is identical. I ran the same filters on the S&P 500 and the FTSE 100. (If I get enthused I may run them on the DAX). 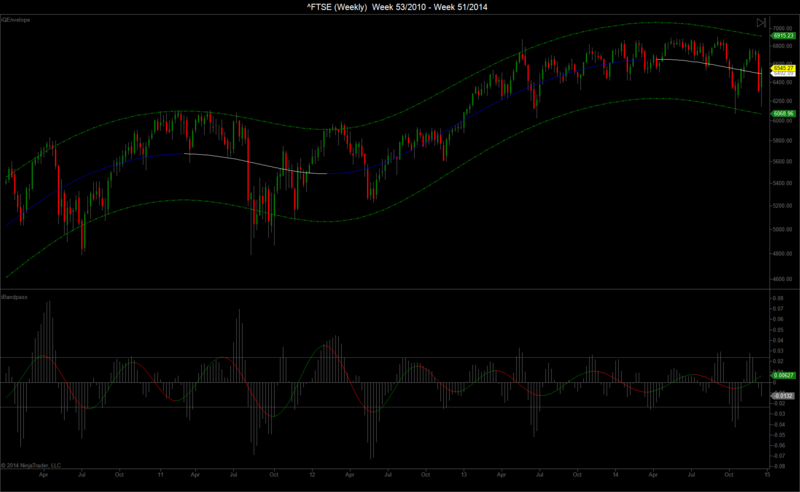 This first chart below is a weekly chart of the FTSE. The price wave at the bottom is what I believe to be the 40 week wave. It averages about 33 weeks over the last few years which is very close to the historical (100+ years) average of the 40 week of the US indices. As a matter of interest the 40 week wave on page 152 of Profit Magic averaged 34.6 weeks over a 17 year period so I’m close enough for government work! The underlying trend is down as evidenced by the downward sloping center-line through the price action. 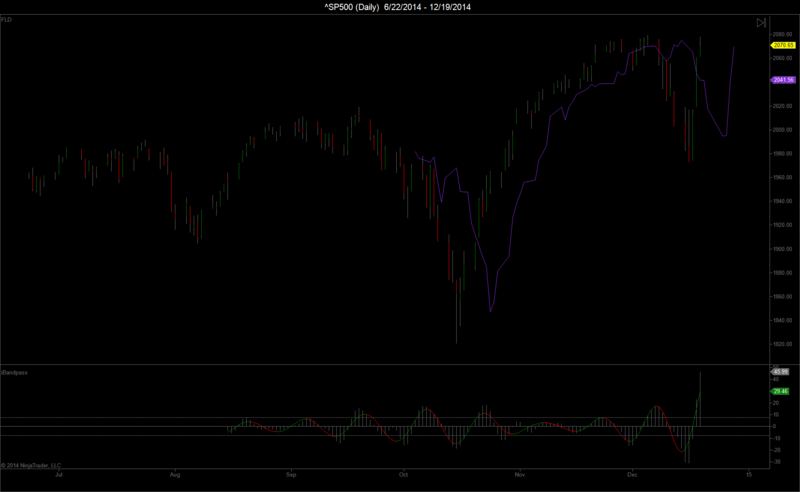 Here is the same chart for the S&P 500, the main difference being that the underlying trend is still up. The next two daily charts show the very dominant 80 and 40 day price waves. There was an increase in the average period of the waves after the February 2014 low. I’m watching to see if this increase remains intact or if they contract over the next couple of oscillations. Last but not least is a daily chart of the 20 day price wave and the ubiquitous 20 day FLD. The big question now is how high will the price action go before falling into the next 80 week low sometime in the second quarter next year, assuming this analysis is reasonably accurate. Since the S&P 500 has been the strongest, any sign of weakness there will spell trouble for the other indices. Happy Holidays. I hope all is well with you. I was looking back at some charts and I am curious. You suggest the next 80 week low being due Q2 2015. If I go with the last 80 week low as mid-October, the earliest time band for the next 18 week low would be due late 2015. I expect the next 40 week low due Q2 2015. Both time periods could be very volatile. All the best. The reason I picked Q2 2015 as the next 80 week low is that my analysis does not paint the October 2014 low as the 80 week low. That would create an 80 week cycle of 99 weeks (November 2012 to October 2014) which is far too long in my opinion. The average of the prior three 80 week cycles (March 2009 to November 2012) is approximately 64 weeks. A 50% increase in the 80 week cycle length from the recent average would be unprecedented, at least in recent decades. It skewed the shorter averages much too long. That is why I believe David’s analysis shows the 80 day nest of lows (December 16, 2014) occurring “early” when in fact they are occurring approximately on time. 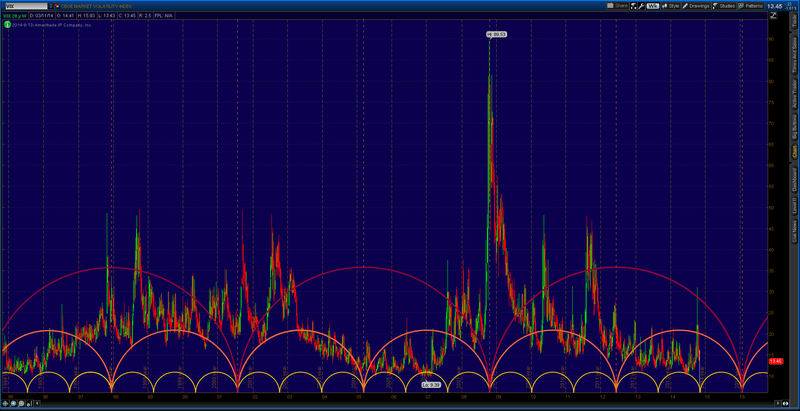 For the past few years the 40 week wave has been fairly evenly spaced according to the filter output. If one follows the simple harmonic, synchronized low approach to phasing, then every other 40 week low is an 80 week low. 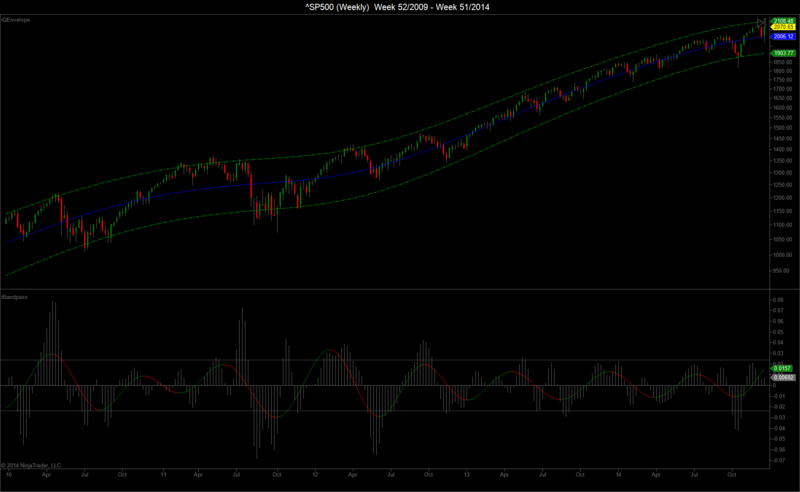 Counting from November 2012, the next 40 week low is also an 80 week low. I agree on the 64 weeks cycle periods for the 18 month Hurst cycle. I was clearly reminded early this year how regular that cycle has been. So based on your excellent bandpass filter work, I drew up some charts and I posted the first one in a comments section here at Hurstcycles. Let me know what you think. As I suggested earlier, it has the next 40 week low due Q2 next year and then something much bigger due late next year. Your chart raises an interesting point. Since you have decided that October 2014 is an 80 week low, your nominal model has caused ST to compress the prior oscillations of the 80 week and shift the prior four phased lows to the left (as compared to my analysis). 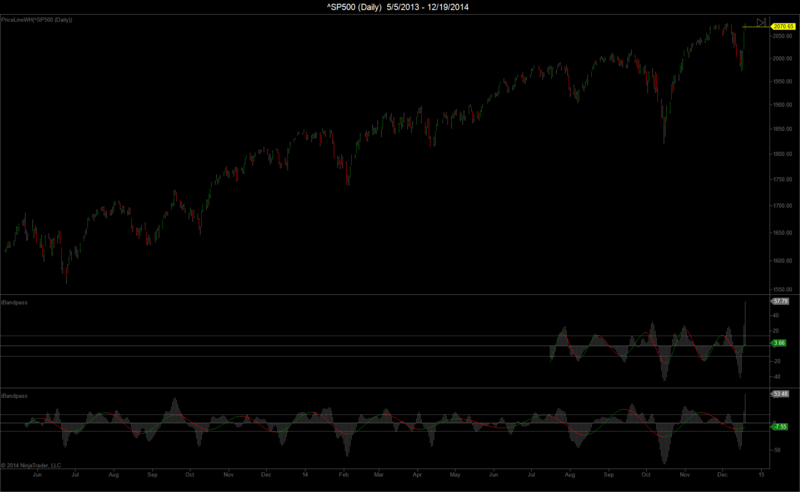 Since ST uses a top down phasing approach, the important question is the proper location of the 4 year low. If your approach has determined that the 4 year low is in June 2012, then your chart is properly reflecting that analysis. 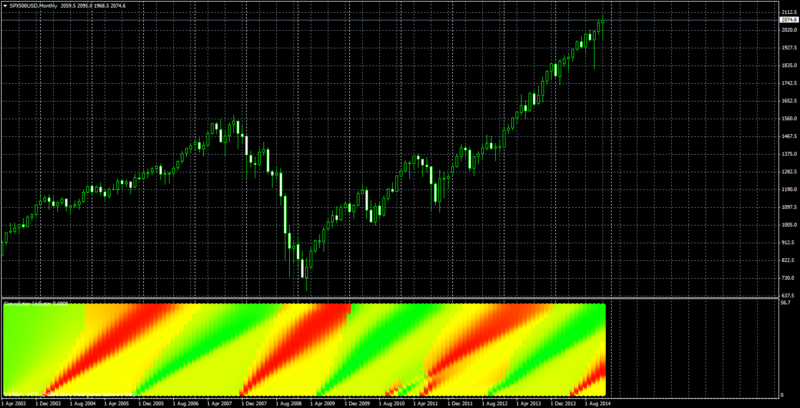 Your analysis has the 80 week wave averaging about 59 weeks since the March 2009 low. That is about 10% shorter than my filter analysis. Yes the placement of the 4 year low is challenging. 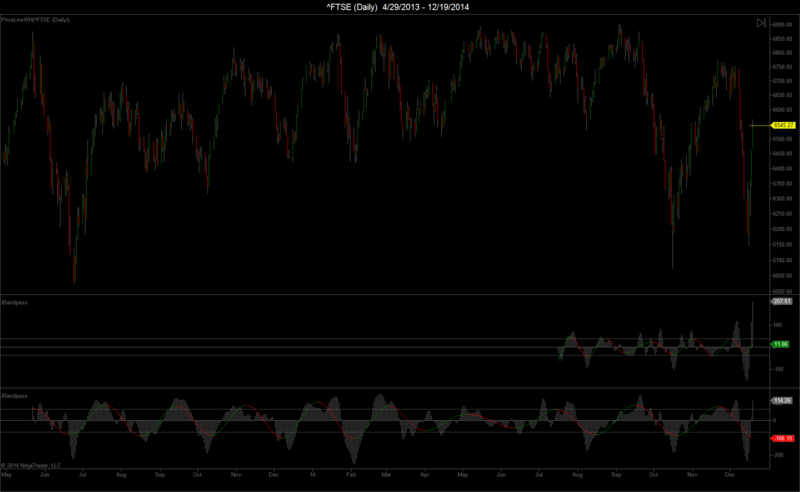 But I differ to the $TSX which lends a better case to a mid-2012 low for the 4 year. 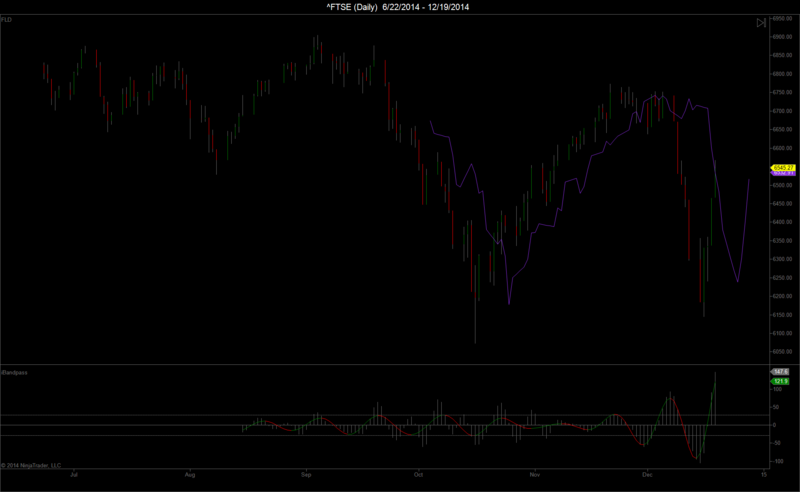 The $DAX which seems to lead the $TSX also shows the same possibility much better than the US indices. TWT. Some fireworks to celebrate the start of the new year that can help to position the 4 year low. It is a convolution applied to the signal after applying a band filter set to 54 mo with one octave band with (which corresponds to the 4y band in the standard nominal model). A convolution folds the two sides of the trough onto each other, and a good correlation should extend towards the top of the graph (at 54 mo), although the correlation gets weaker the further we are away from the trough (hence the widening of the plume, which makes for nice fireworks). The start of the green plumes indicate the three latest 54 mo lows, mid 2005, early 2009, and indeed mid 2012. In addition, the start of the red plumes indicate the 54 mo tops, and january of 2014 is where the last top is detected. So from an analytical perspective the trough that occurred end of january 2014 could well be of 40 w magnitude at the 54 mo top. 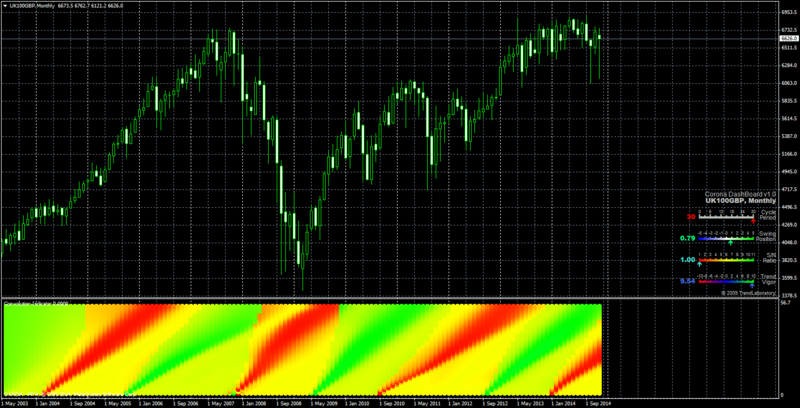 I add two MT4 images with convolution analyses, one for the SP500, one for the FTSE100 in a next post. Both show the same timing. Nice charts Huub. Thanks for posting them.